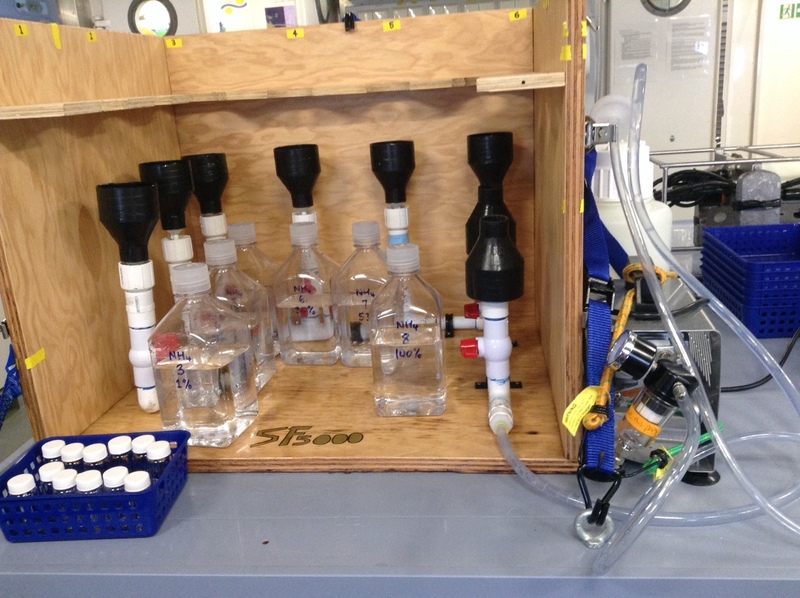 This week Pete and I started doing our experiments with water collected from the CTD profiles. We are using the water to conduct chlorophyll measurements, particular organic matter contents, nutrient samples and incubation experiments. All the data that will be collected from our water samples will help us to piece together the possible mixing that is being caused by the internal tides. The chlorophyll samples that have been taken will all be processed on board using a fluorometer, whereas the other samples require a mass spectrometer which will be sort out at IMAS when we get back into Hobart. Until then, hundreds of litres of water will be filtered to capture the phytoplankton in the water and then frozen so that they do not degrade while we are at sea. In between all the filtering and processing of water, it is imperative that Pete and I stay organized so that we know what samples are what. 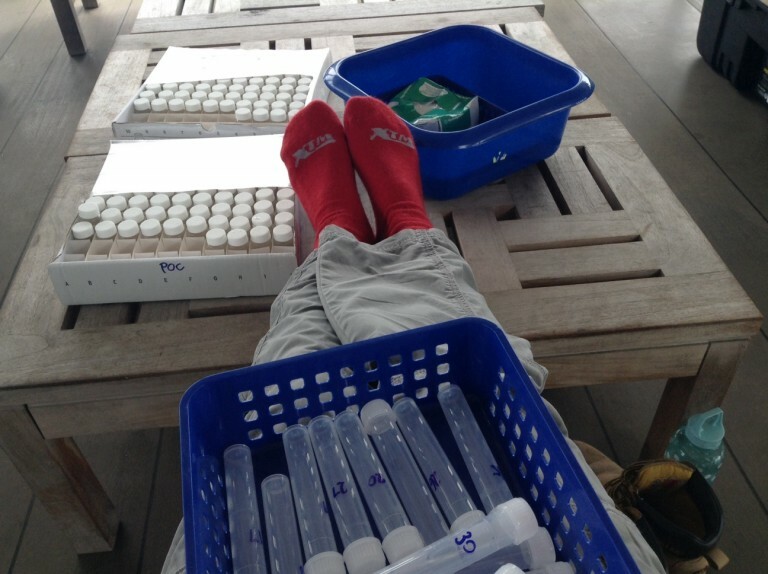 This generally involves labeling sample containers and creating data sheets. These methods will also assist the helpers that will be called upon at IMAS to process samples later on. 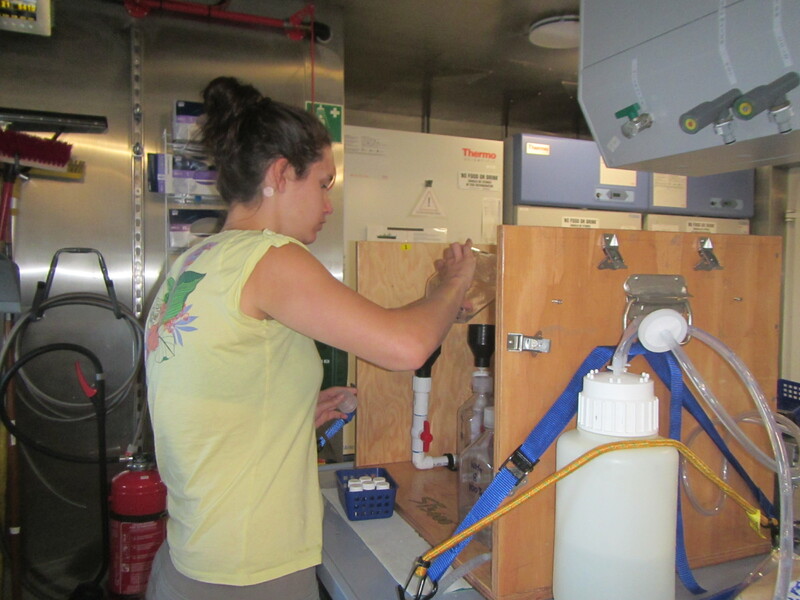 In addition to all the water samples and filtering that we have been doing, we also set up a flow-through fluorometer, which uses the water intake from the ship (ships take in seawater to cool their engines) to identify any changes in chlorophyll at the surface. This particular fluorometer was meant to be attached to the small CTD package. However it didn’t fit in the CTD frame which meant we had to find another use for it, in our case a flow through measurement that will give us continuous surface data. 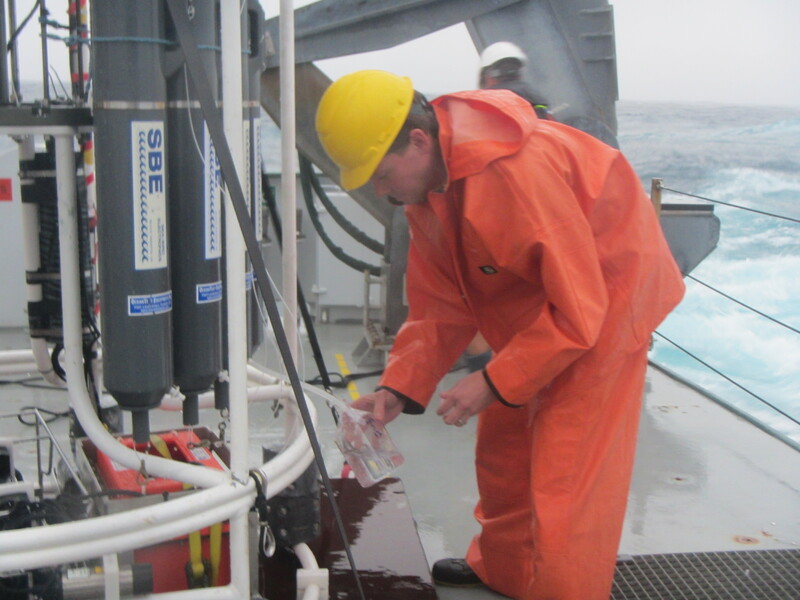 Fluorometry is a very useful tool for biologists interested in phytoplankton. Chlorophyll, the molecule inside the plankton that absorbs light for photosynthesis, will give off light at a distinct wavelength (fluoresce) once it absorbs a photon of light. When chlorophyll is extracted from the phytoplankton using alcohol, a standard fluorometer quantifies this fluoresced light, thus giving a good approximation of the amount of phytoplankton that was in the sample. 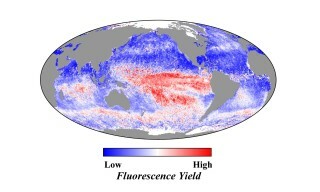 The flow-through fluorometer provides an even better measurement of phytoplankton biomass because it measures the absorbed light energy that is actually is transferred into the photosynthetic machinery of the cell (a process called electron transport) and gives an estimation of how well the intact phytoplankton cells are photosynthesizing in the ambient surface water. We will be using this data along with the data gathered from the standard fluorometer to determine if the internal tide has an effect on the phytoplankton biomass. As discussed in a previous blog, changes in phytoplankton biomass may be due to nutrient mixing and availability, or even mixing of phytoplankton themselves throughout the water column. Mornings on the ship are usually dedicated to science. However, the afternoon usually involves social based activities. For instance, the ship has over 200 movies to watch not including the movies that people bought on their hard drives, or even the odd board game like Cranium or Settlers of Catan. I was also able to help some of the crew members change bike tires. Needless to say, there always something to do or someone to speak to on the ship no matter what time of the day it is!